Carpet Repair. Professional service. Cost effective. Carpet Doctor.
" A professional carpet repair is not only environmently friendly but also cost effective. 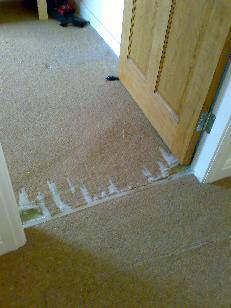 Its not rocket science, why replace a perfectly good quality carpet for the sake of a small burn or minor pet damage when an invisible repair is the ideal remedy " . Why replace a carpet that got slightly damaged by a family pet or a small burn when an expert carpet repair service by Carpet Doctor can quite often be the ideal solution. 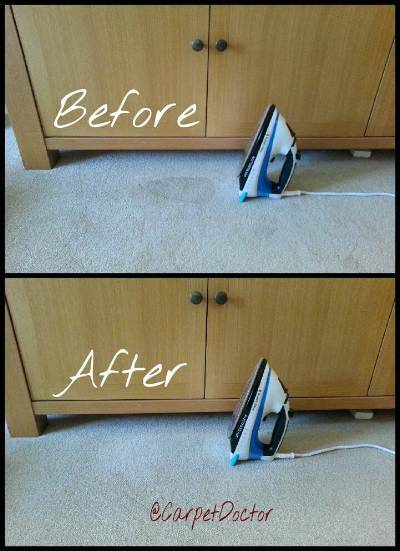 Carpets repaired to the highest standard, with quite often miraculous results. Welcome to Carpet Doctor. For a small carpet repair such as a cigarette burn, Carpet Doctor offers a re-tufting service where tufts of yarn can be carefully plucked from the edges of the carpet and re-tufted back into the burnt damaged area. Assuring you of a perfect colour match and an invisible repair. For a match and patch carpet repair, a donor piece of the same colour and design of carpet that is required for the repair can usually be found inside the floor space of a closet or wardrobe where the carpet fitters may have installed an offcut of carpet left over from the original installation. If a donor carpet can not be found, all is not lost. Carpet Doctor can offer an alternative solution by providing a patch of carpet from a vast selection of carpet sample colours stored on the works van. When a carpet is in need of a patch repair due to a cat scratch, dog chew, stubborn stain or burn damage from a cigarette, it may be quite a dilemma, deciding whether to patch the damage by appointing a carpet repair specialist who is capable of performing an invisible repair or to go down the time consuming expensive route and replace the carpet entirely. What will the repair look like? Will the repair specialist guarantee that the repair will stay permanent over the lifetime of the carpet with regular vacuuming and deep carpet cleaning? These common questions can make it difficult to decifer whether to go for a professional patch repair or perhaps treat yourself to a new carpet. 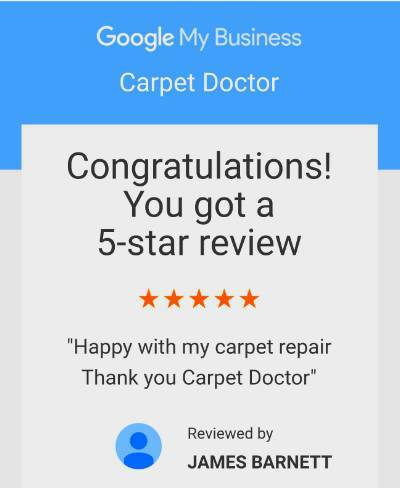 Carpet Doctor is very aware of these type of questions and often assures the client of a professional service with over 20 years of experience and know how to repair carpets using expert tools and materials including seaming solutions and hessian tape for binding to produce an invisible repair. If all avenues have been exhausted and the carpet is damaged beyond repair then Carpet Doctor can offer a quote for a new carpet with expert installation. Carpet repairining is also enviromentally friendly. Every carpet repaired by Carpet Doctor is another carpet saved from going to landfill. Repairing carpets to a very high standard around the UK since 1997, Carpet Doctor has the ability to repair a carpet without any fuss or the need to move any furniture. 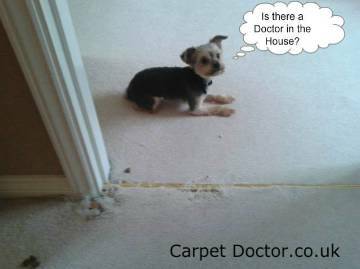 Pet damage carpet repairs by a pet friendly carpet repair man. With many years of carpeting knowledge and experience, Carpet Doctor is delighted to provide a professional repair service for all types of carpet damage including a carpet burn repair, carpet patching, loose carpet edges fixed, fitted, secured and repaired using high grade materials to achieve an invisible repair. Carpet Doctor carries a wide range of carpeting tools to suit every task. Rest assured we can fix and repair carpet holes, burns, seams. Re-tufting and re-threading carpet snags in a berber loop carpet is also part of the service. Carpet Doctor has the remedy to wipe away carpet stains, shrink out carpet rucks, re-stretching carpet bumps and removing carpet wrinkles, rips & spillages. Domestic and Commercial carpets fixed, fitted, secured, repaired and restored with Carpet Doctor at your service. Professional carpet repair by an expert carpet fitter. Watch our latest carpet repair video, Invisible repair. Carpet Doctor has the remedy for a variety of carpet damage by providing a truly outstanding home and office professional carpet repair service. How to patch carpet repair. Experts for Carpet Repairs in Birmingham. Carpet Doctor. © 2019 Carpet Doctor. All rights reserved.